Meet the Beatles for Real: Dr. Winton O'Boogie Visits Philadelphia! Dr. Winton O'Boogie Visits Philadelphia! 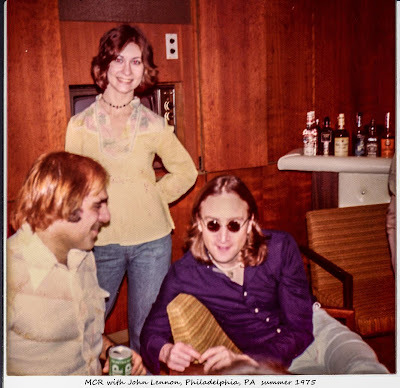 Every time I post photos and stories of fans that were fortunate to meet John in Philadelphia in 1975, I think that will be the end of it, but then I find more and always want to share them. These are from the "New Beatles Fan Club"
John received two long-distance phone calls, both of which were broadcast live over the radio. One was from Yoko, and the other was from Neil Sedaka (who you may recall dedicated his song, "The Immigrant" to John). John had a lot of fun picking out records, doing the weather report, jumping in the middle of commercials, saying things like "Gay people are beautiful," and singing along with Ringo when "Yellow Submarine" was played. Mr. Lennon also spent a lot of the weekend in the parking lot signing autographs, posing for pictures with fans, and kissing people. All in all, it was a delightful, typically John Lennon weekend. Guess what? 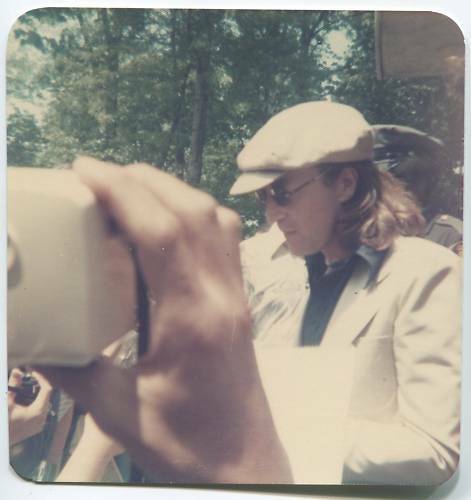 I met John Lennon on May 16th and 17th, 1975 in Philadelphia,. See, every year WFIL radio has a marathon to help raise money for all kinds of handicapped kids (by all kinds I mean blind, crippled, deaf, etc.). This year John agreed to come and help out with it. He signed autographs for fans who came to the studio to see him, posed for pictures, and the usual bit. The marathon was to start on May 16th at 3pm, and I knew John would be there early and naturally, I wanted to be on hand for his arrival. I got to the studio about 1pm with a few things I wanted him to autograph, plus my trusty camera was with me. John arrived at about 2:00 to a crowd of about ten or so people. All of us there had thought we'd never get to see him because of his deportation and all. We had fun. He signed for me an 8 x 10 picture (the one from the White Album), my autograph book, "In His Own Write," by J.L. (who else but? ), my Beatles t-shirt (which I was wearing at the time), and a poster about the marathon which I had "borrowed" from the front desk. And John posed for as many pictures as he possibly could before he had to go back in. By the time 3pm came around the crowd grew. And he would come out off and on during the evening to sign autographs and stuff. But he went to the hotel to rest until about 9:00 the next morning. On the 17th, I went with all the Beatles magazines I've collected over the years to have John sign. What got me is that he remembered me from the day before! And he was more than happy to sign all those magazines for me. Anyway, at one point around noon, the days of Beatlemania returned! When John came out for the third time that day this one girl got overly excited, and her excitement spread quickly through the crowd. Naturally, John had to hurry back in, and the cops and guards tried their damnedest to get us in a state of normalcy! Of sure, the Philadelphia cops and the WFIL/WPVI guards were around to keep order, but they let us the fans and John to ourselves because we all wanted to meet him and he us. And we were a good enough crowd that we got no hassles. Other than that one incident everything was great! But everything went cool! I couldn't go on the 18th even though I wanted to. I did take some pictures, thought and they turned out beautiful. As for the marathon, they raised over $115,000.00 for the kids. And most of it was because of John being there. The weekend was over too soon, and at the end, I felt like crying. I always wanted to meet a Beatle, and I finally did. I never thought I would and never thought if I did that he'd be so nice. I heard all these things saying that John was this or he was that, but they were all implied. All I can say now is that all those rumors are just rumors and I should be ashamed for in any way believing them. John was just the nicest man. All I could do is love him. I really can't describe my feelings towards him after that weekend. John is nice and not the "thing" people say he is. He is human, too! OK, this makes up for John's "cripple" faces and walks.